The joy of discovering ones own voice is the central focus of all KULTUR FÜR KINDER’s music and singing projects. We find it particularly important that children and their teachers sing together. Direct contact with engaged musicians and their instruments in schools and in Vienna’s historical locations should awaken in children the joy of singing melodies from across the world in the classroom and at home. Above all, at the end-of-project concerts in Vienna’s most famous venues – for example the Konzerthaus and the home of the Vienna Boys’ choir, MuTh – the children are invited to perform alongside professionals and experience the stage for themselves. With traditions dating back 600 years, the Vienna Boys’ Choir exemplifys the unity of excellence and a love of choral singing. Their repertoire comprises pieces by the master composers and songs from across the world. Our cooperation with the Vienna Boys’ Choir should get as many children as possible singing on a long term basis, and support teachers with training courses on the teaching of singing in the classroom. Choral projects should enable the children to discover their own talents and should unite the many nationalities in the classroom through a joint love of singing. 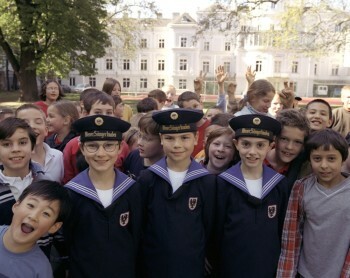 Music projects designed by KULTUR FÜR KINDER support the cooperation of the primary schools with the Vienna Boys’ Choir. Together they will delve into the wealth of songs, which the Vienna Boys’ Choir brings with it from international tours, and they discover the joy of singing and the beauty of one’s own voice. The starting point for all our projects is to support teachers in the successful integration of cultural content into the curriculum, and then into family life. 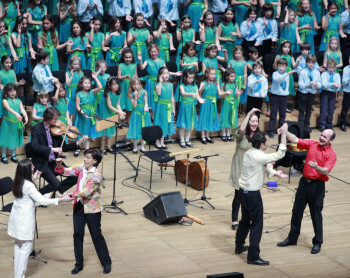 Songbooks, musical stories and singing exercises should stimulate the teachers to prepare the children for a concert experience, of which the children’s voices will be the focus. Children and their teachers will be encouraged and helped to participate actively in the cultural life of our city. They will be provided with invitations to concerts, teaching materials and training from experts in the music industry.